"Splash Gomera" is a small friendly & relaxed dive and watersports centre in Playa Santiago, La Gomera. We can offer Diving, Snorkelling, Kayaking and Stand Up Paddleboarding. We have PADI diving courses from beginners to professional level. You can also take your pick of 13 PADI specialities including DPV, Night Diver, and Digital Photography & Nitrox. Emergency First Response first-aid courses are also available. We are just 40 metres from the beach and only 600 metres from Playa Santiago's picturesque fishing harbour where our boat is moored. We dive daily from our Valiant PT650 6.5m RIB & arrange night dives on request. Whether you only have time for one dive or you're part of a group we aim to make your diving as relaxed, fun & as safe as possible. We have Stand Up Paddle boards as well as single and double kayaks to rent by the hour or come along on one of our guided kayak tours. We also have snorkelling equipment to rent so you can go off and explore on your own or join us on a guided snorkelling excursion. The picturesque & tranquil fishing village of Playa Santiago is on La Gomera's sunny south coast. It has the highest number of sunny days of any village on the island. Being sheltered from the NE trade winds we benefit from calm flat seas, so we can offer year round diving for all levels of experience. We have over 20 dive sites within 15 minutes ride in our RIB “Splash” & are constantly exploring & adding new dive sites as we find them. 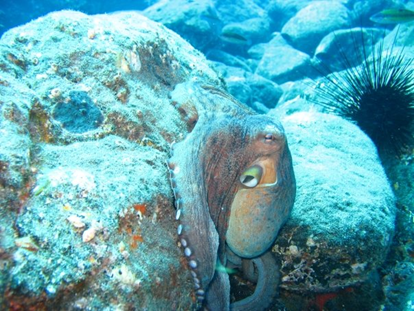 La Gomera has 92km of virtually unexplored & un-dived coastline. 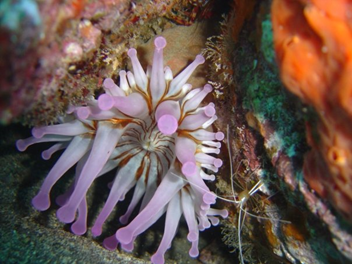 For the more experienced & adventurous there are drift dives, caves & deep reefs to explore. With sea temperatures between 18 C to 24 C and beautiful clear blue water La Gomera offers some of the best diving in the Canary Islands. There are no hoards of dive boats leaving the harbour & no curtains of bubbles on every dive site. The sub tropical waters, rocky reefs & sandy bottom are home to 100s of species of fish and invertebrates. The conditions are excellent for photographers or those with video equipment.